This section, comprised of civil deputies, is responsible for serving and enforcing civil processes issued by the courts to include Summons, Petitions, Subpoenas, Real and Personal Property Executions, Orders of Seizure, Attachment Orders, Warrants of Eviction, Orders of Protection, and Civil Arrest Warrants. A Warrant of Eviction should be brought to or mailed to the Civil Process Division at 407 South State Street, Syracuse, New York 13202, with the appropriate fees. The landlord will be asked to provide information regarding the tenant. 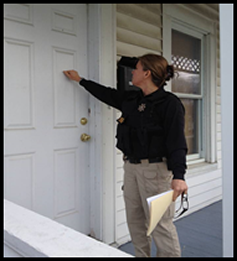 A deputy will be assigned to the case and will attempt to locate and serve the tenant with the Warrant of Eviction. The tenant will also be served with a Notice of Eviction which indicates the date they need to vacate the premises by. Typically, the tenant is allowed 72 hours from the date of service to vacate. Once the Warrant of Eviction is served, the deputy will notify the landlord or the attorney and schedule a date and time to meet at the premises to enforce the Warrant of Eviction. At that time, the landlord will be expected to provide the personnel and equipment necessary to remove the property from the premises and to have the lock changed. Once the tenant(s) and their property have been removed and the locks have been changed, the deputy will officially turn possession of the premises over to the landlord. As the landlord, you should obtain legal advice from an attorney. In several municipalities it is a violation of ordinances to place a tenant’s property out at the curb. The landlord has the option of placing the tenant’s belongings in a storage facility. It is important to remember that the tenant should be allowed access to their belongings. The landlord is not allowed, by law, to discontinue any essential services to a tenant for non-payment of rent. The tenant should contact the local police department or the New York State Attorney General’s Office to report the matter. A landlord may be liable for damages for attempting to unlawfully evict a tenant. Once a judgment has been issued by a court, a creditor may obtain an Execution. An Execution is an instrument that is used to have personal property or real property seized. The property would then be sold at a public sale and the proceeds would be turned over to the Creditor to satisfy the debt. If you are a Judgment Creditor, you may want to seek legal advice from an attorney on the remedies that are available to you. In Onondaga County, Family Court will send an Order of Protection to the Civil Process Division to be served on the Respondent. The Order of Protection is not enforceable until it is served, therefore; it is important to provide the court with the most up-to-date information about the Respondent so the deputies will be able to serve him/her quickly. If the Respondent violates the conditions indicated in the Order of Protection after it has been served, you should contact the Sheriff’s Office or your local police department and file a complaint.